Sunrise Hitek is pushing the envelope in protecting laptops in K-12 school One-to-One technology programs. At FETC 2018 Orlando, the company will be exhibiting at the upcoming FETC Conference in Orlando, Florida. They will be offering a free multi-device charging cable to visitors to their booth. In addition, attendees will be able to enter a daily raffle for a free backpack with (5) winners per day. Sunrise Hitek is pushing the envelope in protecting laptops in K-12 school One-to-One technology programs. At FETC 2018 Orlando, the company will be launching the latest G3 Chromebook bag with Alumishield technology, designed to eliminate broken laptop screens caused by rough handling by students. Other items on exhibit include the 6th generation rugged case for iPad 2017, and Apple MFi certified iPad keyboard. HITEK products are specifically designed for the education market, find out more here. The annual Future of Education Technology Conference (FETC) is one of the premier educational technology conferences. This annual event is attended by a wide variety of people in the educational sector such as administrators, IT directors, and teachers. The conference is taking place on January 23-26th at the Orange County Convention Center in Orlando, Florida. 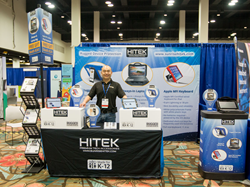 This year, Sunrise Hitek is pleased to be in attendance showcasing their bestselling tech accessories, geared toward schools. Sunrise Hitek will have their three best rated products on display: the iPad Wired Keyboard, Chromebook and Laptop Bag, and the Slim Tough Case for iPad. They will be on-hand to answer any questions and to provide demonstrations of the products. They will be offering a free multi-device charging cable to visitors to their booth. In addition, attendees will be able to enter a daily raffle for a free backpack with (5) winners per day. Sunrise Hitek’s accessories have to this day been used by over 220,000 students in over 3200 schools...and growing! The HITEK Wired Keyboard is an asset to any classroom or office. Buyers can choose a model compatible with all iOS devices with 8-pin Lightning port, which would work for all Apple products produced in 2013 or later, or the 30-pin dock connector, compatible with older devices including iPad 1/2/3/4 and older model iPhones. The wired keyboard has been a huge hit with schools. For example, Ray W. from Charenton, LA recently said:: I am happy to offer great feedback on the [iPad wired] keyboards. We ordered only 6 to have a classroom trial test the keyboards on the iPad minis that that classroom has. I was able to set up the iPads with Microsoft Word and set up printing from the iPad to a network printer. Our teachers are interested in getting more keyboards. The HITEK Chromebook Bag offers the ultimate in laptop protection. The rugged laptop bag is made of durable ballistic nylon on a rigid frame. Its “always-in” design with proprietary Cooling Channel™ technology allows the computer to be used without being removed from the case. The “always-in” design is so special because it enables the laptop to stay in the case at all times, preventing a myriad of damages that could potentially occur such as dropping or cracking of the screen. HITEK’s exclusive universal corners ensure a perfect fit for any laptop model, and lowers schools upgrade costs when changing devices. To ease schools’ cumbersome process to track their computer assets, HITEK bags are designed with a barcode compatible clear asset tracking window for easy check-in/out. More info is available at the company’s website. The best selling iPad case is the Slim Tough Case G6 for iPad 2017. It features a dual-layer construction using rigid polycarbonate wrapped in shock-absorbing silicone rubber, and comes with a built-in screen protector. Its thin profile makes it compatible with all charging carts on the market. In addition, the case come with removable kickstands or optional hand strap, and can be custom branded with school’s name and mascot. HITEK offers free samples for K-12 schools on their website.